Emilio Pucci is a line that has been around for a long time and is underrated, in my opinion. He's from Florence, Italy and his daughter Laudomia Pucci became the head designer after his passing in 1992, until LMVH acquired the majority of the fashion house in 2000. 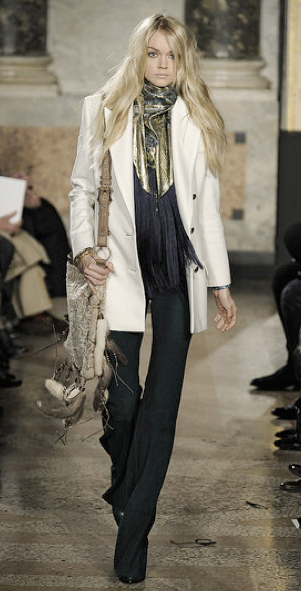 Norweigan designer Peter Dundas, recently appointed creative director, carries on the traditional graphic prints, flattering shapes, and subtle use of bold colour for the Fall 2010 line. It is a little darker than their typical collections, which has me in absolute AWE. I finally learned how to make my photos larger. I used to be a pro at HTML when I was 12, it seems in the last 10 years things have only gotten "more simple" which in my brain obviously translates to more complication. All I need is a professional camera and I'm on my way to better blogging!!! I'm not a fan of Pucci but this are amazing!!! this pucci collection is the best i've every seen ! So amazing! I love this collection from Pucci! Especially the black lace dress! Nice post!